Broward County Public Schools serve over 32,000 students with disabilities and offers a free and appropriate public education in compliance with the federally mandated IDEA. A continuum of services and programs are available to meet the individual needs of students eligible for special education and related services, ages 3 through 22. This continuum of services may be provided in a variety of settings, which include general education classrooms, resource rooms, specialized day schools, and hospital homebound. Eligible students are provided supports and/or services as per their Individual Education Plan (IEP) that are based on each child’s unique needs, as related to their present levels of academic achievement and functional performance. Exceptional Student Learning Support Division staff provides professional learning opportunities and instructional programming to facilitate high quality instruction for students with disabilities. 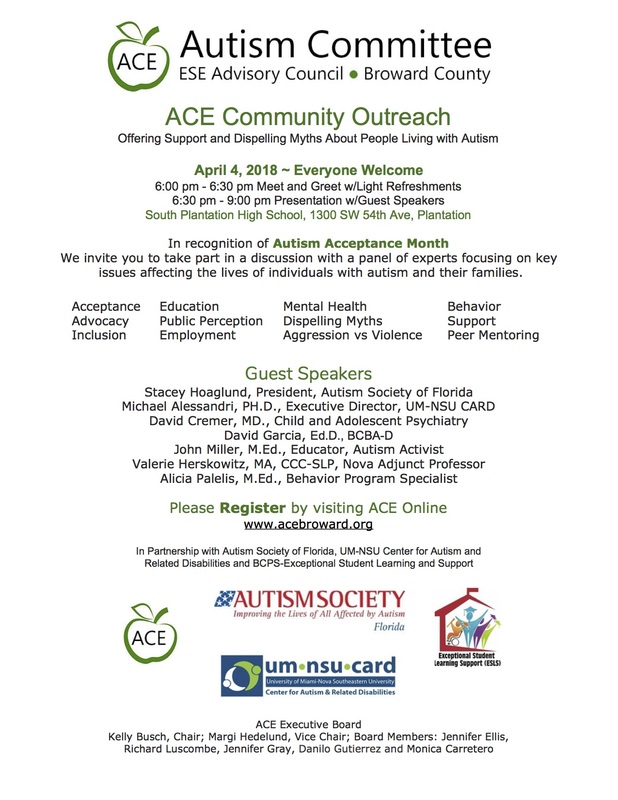 Supplemental services are provided in collaboration with discretionary projects such as Florida Diagnostic and Learning Resources System/Florida Inclusion Network and the Multiagency Network for Students with Emotional/Behavioral Disabilities (SEDNET).